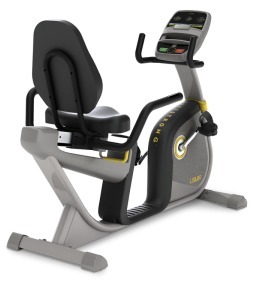 The Livestrong LS5.0R recumbent bike offers well-designed programming to take your weight loss fitness goals, strength, and endurance to the next level. 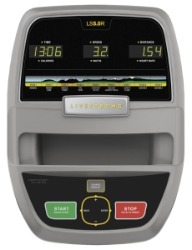 There are three large LED feedback windows that show time/calories, speed/watts, and distance/heart rate. Press the Change Display button to toggle between the two sets of readouts. UPDATE: Johnson Health & Fitness has discontinued the LiveStrong brand. 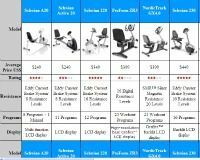 For a comparable model check out the latest Horizon & Vision exercise bikes at the official company store. According to reviews, the Livestrong LS5.0R recumbent bike offers big value at a reasonable price. 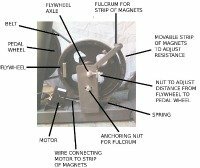 It has a smooth and quiet 8.8-lb flywheel, magnetic resistance, an easy-mount step-through steel frame, and a padded seat with back support. The pulse grip sensors are mounted on handlebars conveniently located on each side of the seat, which features a one lever adjustment allowing the user to slide the seat forward or back to comfortably reach the pedals. The nine programs or “stages” of workouts resemble terrain that Lance Armstrong would encounter on a long road race and they include Manual, Weight Loss, Muscle Toner, The Tour, Constant Watts, Mellow Johnny’s Trail, Lance’s Climb, and two custom workouts. Each workout offers up to 10 difficulty levels plus the 16 resistance levels to burn calories, build endurance, and develop leg strength. Easy to assemble, attractive, fun, well-designed, comfortable, sturdy, and endorsed by pro cyclist Lance Armstrong, the $799 Livestrong LS5.0R recumbent bike is an excellent choice, especially if you can find it on sale at $599 with free shipping. The console layout and the grey and black frame with smooth contours makes this one of the best-looking bikes on the market and it will be a pleasing addition to your home gym. But it’s not just for looking at: these programs have an interesting appeal that will make you want to try all of them as you pedal your way to your fitness goals.